We all wanted to make the Kessel Run in under 12 parsecs didn’t we? It was an ungainly yet agile star ship, capable of out-maneuvering the fastest TIE fighters and out-running the largest Star Destroyers. We can safely say that most of us probably wished our toy models of the Falcon were more than a toy, and now they are! 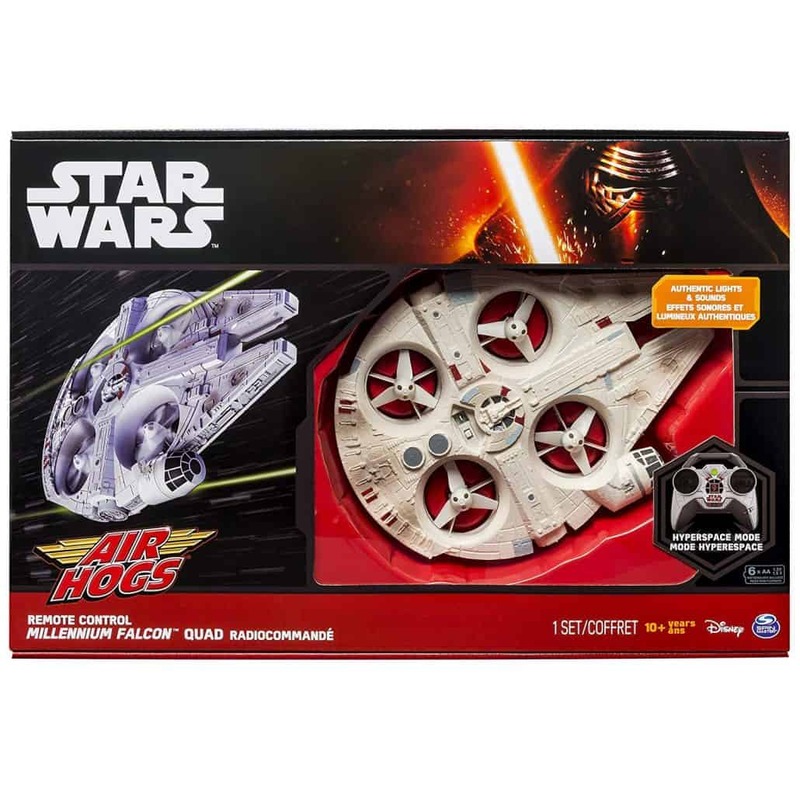 Air Hogs has recently released a Millennium Falcon drone, and it actually flies! It is truly a surreal experience to watch it fly through the sky, soaring just like it would in the movies. It is designed to be as sleek as possible. There are no protruding propellers or wings; instead, the body contains the four propellers that power its flight. 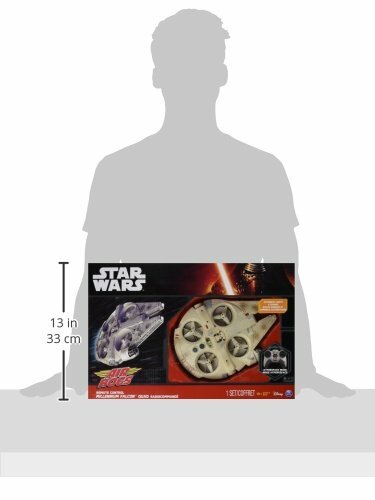 In fact, the body is nearly the exact shape and design of the Millennium Falcon we all know and love in the movies. Although most drones are designed symmetrically for smoother flight and better weight management, the designers of this drone managed to make to keep performance while still having a non-symmetrical body design. All you experienced drone operators will likely be disappointed by the lack of trim adjustment (trim adjusts how the drone moves, just in case you non-professionals were wondering). However, the lack of trim adjustment is not a big deal because the Millennium Falcon flies relatively stable on its own. It is able to hover and do tricks without any serious problems from the lack of trim adjustment. After a bit of practicing, you should be able to fly it just fine (indoors, outdoors might take more practice) without crashing. 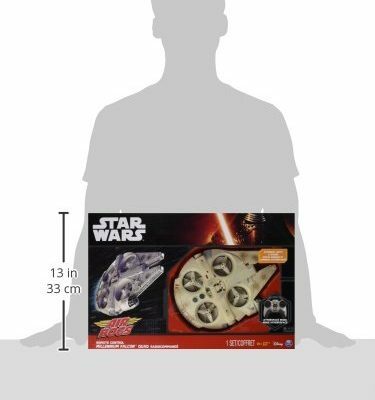 The Millennium Falcon itself comes with its own internal batteries. These batteries just require a bit of charging to operate and don’t require any extra parts on your end. However, the controller is a different story. You’re going to need to empty out all your draws and search the cracks of your house because the controller requires not one, not two, but sixAA batteries. It is surprising because the controller does not look large enough to contain six batteries, but it somehow manages. This can be a downside because, as we are all probably aware, batteries are not all that cheap, and you’re probably going to have to go out and buy a fresh pack just for this drone. It essentially adds another ten dollars to the price tag, which can be annoying, especially if you just received it in the mail, only to find out that you have only five batteries in the house. It is not clear why the controller needs six AA batteries, but we suspect it may have something to do with those sound effects we mentioned earlier. 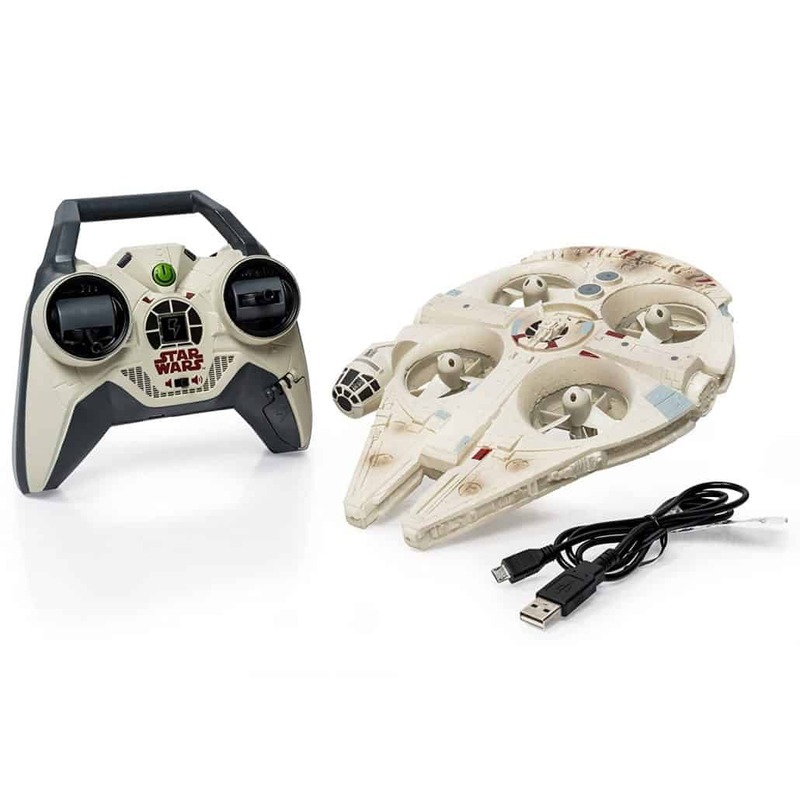 The controller is also used as a charger for the drone itself, so this is likely a reason for having more batteries, but it is not clear why you can’t just plug the Falcon into a wall socket instead. It is disappointing to see such a large battery requirement for a feature that does not work that great and is unnecessary to the overall aesthetic of the Millennium Falcon. The charging issue could be solved by making the Millennium Falcon wall charger compatible but it isn’t. Just be sure you stock up on batteries before buying this item, and send a pack of batteries with it if you send it as a gift. Overall, the battery life is nothing special. It is similar to most drones in respect to flying time and charge time, although the flight time may be a little shorter than is typical of some drones in the $100+ price range. The charge time is over an hour, which might be disappointing to some, but is, again, typical of many drones. The controller, however, stands out from most drones. It is an extremely simple remote, yet it still requires six AA batteries to operate. 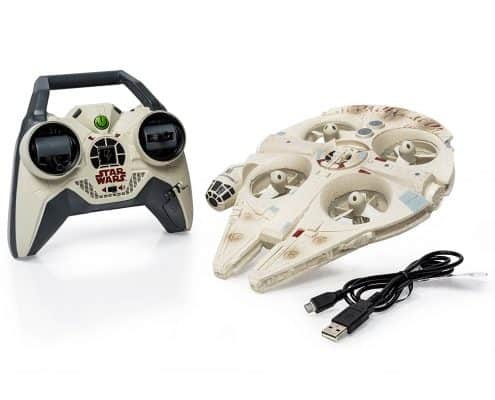 The remote does allow for charging of the Millennium Falcon, which is useful if you want to take it on a trip, but it mostly is an annoyance because it requires so many batteries. If you take the Falcon outside, it quickly becomes clear that it was solely designed for indoor use. The layout of the rotors makes it very unstable, especially if there is wind. The four propellers are located next to each other within the Millennium Falcon’s main fuselage. This allows for the design to be as close to the original as possible, but sacrifices the stability that would be provided if the rotors were to be spread out. The Falcon does not have a high top speed and lumbers around rooms and corridors. This is an advantage in some ways as it makes it easier to maneuver around in tight spaces where room is not readily available. It handles like a standard quadrotor drone. It can fly in all directions and it can rotate horizontally. It can hover and it can move vertically up and down. Essentially, it flies more like a helicopter than a place (or spaceship in this case). The range is limited to some degree by the range of the remote (200 ft), but it is unlikely that you will fly the drone out that far, especially if you don’t plan on flying it in the outdoors. It should also be noted that many people have reported that the range is much lower than advertised. Some reviewers have reported that controlling the Millennium Falcon becomes difficult at ranges as low as just eighty feet. This lack of range makes it especially suited for inside play or flying around a small garden. It certainly is not like other drones that you will fly off until they are barely visible. In many respects, this is just a standard RC toy, albeit one that can fly. The sound effects can be controlled with buttons on the remote and the sound comes from a speaker also on the remote. The sounds are mostly random, some of them having to do with the Millennium Falcon, others just are character sounds from Star Wars. You can listen to Chewbacca growl, R2-D2’s beeps, and the roaring of the Millennium Falcon’s engine. The sounds are somewhat interesting but do not add that much to the overall impression that the Millennium Falcon makes. For older fans, these sound effects will likely seem tacky and unnecessary, but younger fans (it is an 8+ toy after all) will undoubtedly love hearing the voices of their favorite Star Wars characters. Overall, it performs well. It is not as good as a high-end drone, but it is not supposed to be. 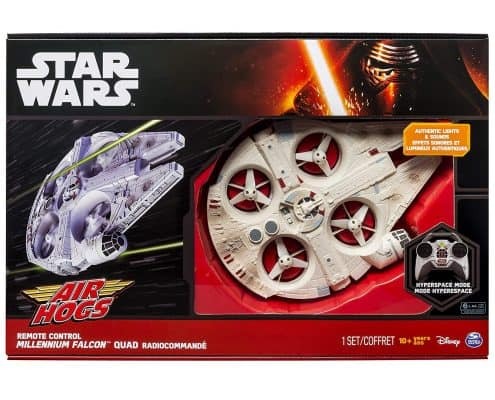 The main focus of this drone is the design; it is the Millennium Falcon, and that is the main selling point. The drone is not built for speed or maneuverability but performs just fine at both. The gyro located inside of the Falcon is a big help in assisting pilots, and it is not difficult to learn the controls. 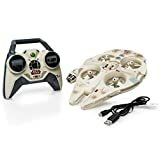 The controls are exactly the same as any other remote control drone, plane, or helicopter, so if you have any experience with RC flying, the learning curve will not be too steep. 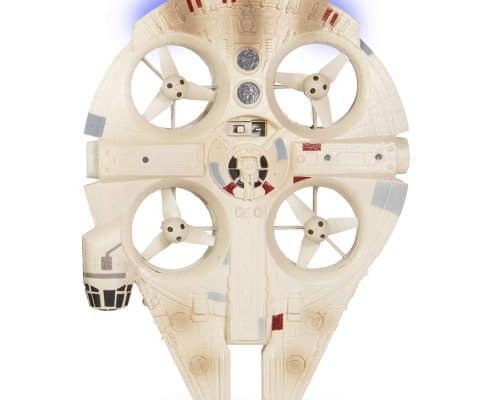 Unfortunately, the design of the Millennium Falcon makes it difficult if not impossible to fly outdoors in wind. Wind will blow this drone around like star destroyer trapped in a cosmic black hole. Indoor use is recommended by most users and reviewers, but outside play is not difficult, although it should be remembered that the range of the controller is much less than 200 feet. 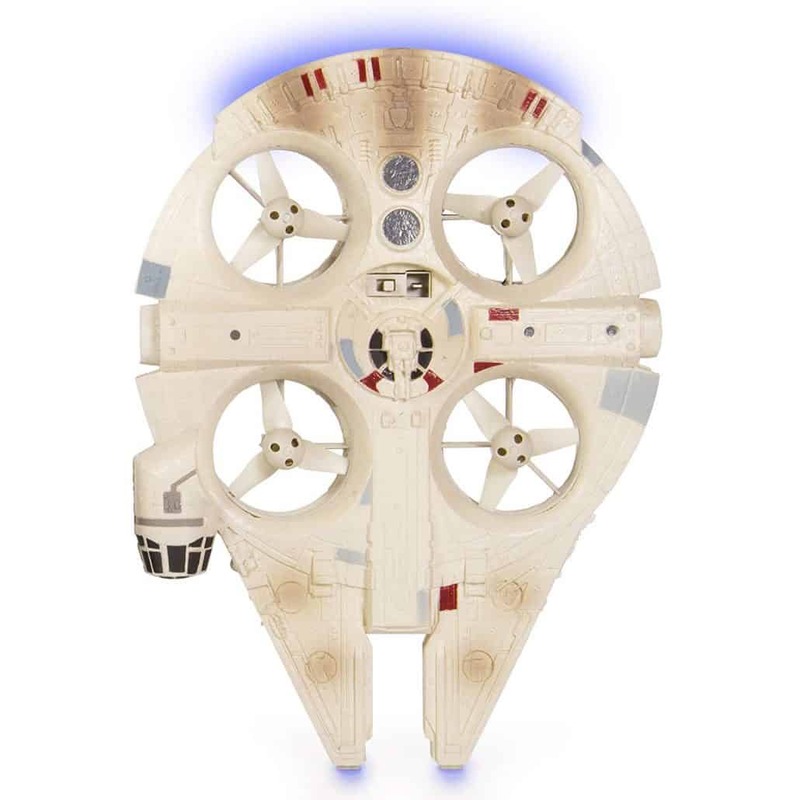 As previously mentioned, the design of the Millennium Falcon drone looks amazing. It is not an exact replica, but it is close enough to the original so that it is easily recognizable from a distance. The designers did not attempt to make it purely functional and clearly made some sacrifices to performance in order to make it look closer to the Falcon we see in the movies. But let’s be real, none of us are buying this because it is a high-performance drone, we are buying this because it looks downright cool flying through the sky. From the side, the Millennium Falcon looks as if it is floating. The propellers are well placed within the body of the Falcon so that they are only visible when the drone is looked at from above or below. From the front and sides, it looks as if the Millennium Falcon is really there, hovering right in front of you! The rotors are removable and can be easily cleaned. This is ideal if you have an issue with tangling (don’t fly it into your hair!) as it allows for easy de-tangling without having to buy a new drone. If you are having issues with your Falcon, try taking a look at the rotors. It may be that they just have accumulated dirt or hairs, preventing it from flying with full charge. It is really cool. That’s all. Just kidding, we wouldn’t slack off like that, but it still is really cool. We have been waiting ages for something like this to come out. Only recently has drone technology gotten cheap and small enough to be able to create something like this at a decent price. The performance is fine, and is well suited to indoor play. Wind and breeze will easily knock it around outside due to its light weight. It does have a gyro which helps keep it level, and the controls are not difficult to master. The body is durable, which is perfect because mastering the controls will take some time (and plenty of crashes). The addition of lights to the body of the Falcon is really amazing and it makes night flying easy and incredible to behold. The battery is OK. The flight time is typical of most drones, and so is the charge time, so we can’t really blame the manufacturers for this. However, it seems odd that you have to charge the Falcon from the controller. This does make it more portable, but it seems like they could have just given a wall charger brick instead of making you buy more batteries. It should be noted that you can charge the Falcon from a wall socket, but you need a USB wall charger. Overall, it is well worth the price if you are a fan of Star Wars. The feeling of awe when watching the Millennium Falcon fly in real life like it does in the movies cannot be stressed enough.